27 October 2014, at 11:27p.m. US - The total number of pig farm samples that have tested positive for the Porcine Epidemic Diarrhoea (PED) virus now stands at 8,702 in 31 states, writes Jackie Linden. There were 73 new positive samples in the most recent week reported. 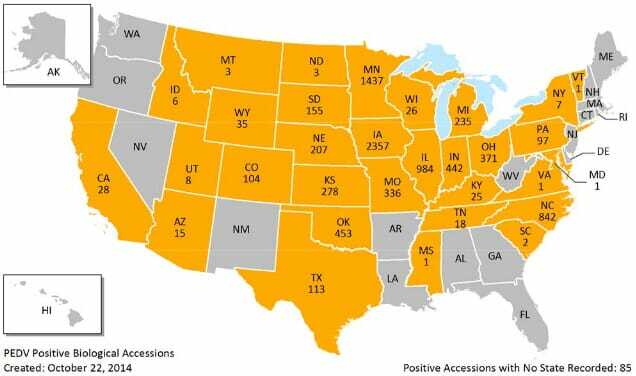 The National Animal Health Laboratory Network (NAHLN) reports 73 positive accessions out of 726 tested at nine veterinary diagnostic labs for the week ending 11 October, according to the American Association of Swine Veterinarians (AASV). 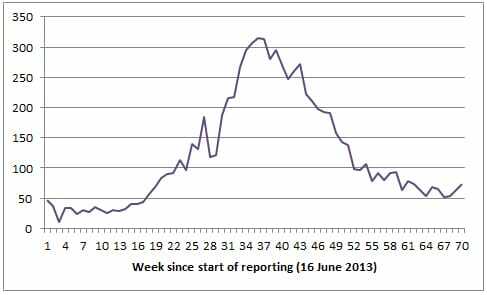 The total number of pig farm samples (termed 'laboratory biological accessions' in the official report) that have tested positive for the PED virus (PEDv) since April 2013 now stands at 8,702, which includes 73 for the most recent week. 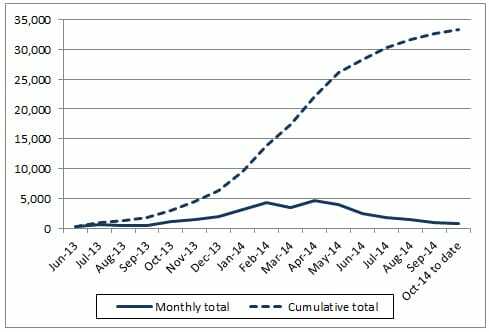 For the current month to date, 1,959 accessions were tested, of which 176 samples or 9.0 per cent tested positive for PEDv. Since testing was fully reported in November 2013, 35,918 farm samples have been tested, of which 22 per cent have tested positive for the virus. For the current month to date, 226 farms have been tested, of which 29 samples or 13 per cent were positive for PEDv. Since testing was fully reported in November 2013, 4,839 farm samples have been tested, of which 1,888 samples or 35 per cent tested positive for PEDv. For the current month to date, 304 farms have been tested, of which 19 samples or 6.3 per cent were positive for PEDv. Since testing was fully reported in November 2013, 5,315 farm samples have been tested, of which 1,523 samples or 26 per cent tested positive for PEDv. For the current month to date, 357 farms have been tested, of which 32 samples or 9.0 per cent were positive for PEDv. Since testing was fully reported in November 2013, 6.196 farm samples have been tested, of which 1,494 samples or 19 per cent tested positive for PEDv. For the current month to date, 135 farms have been tested, of which three samples or 2.2 per cent have tested positive for PEDv. Since testing was fully reported in November 2013, 3,012 farm samples have been tested, of which 675 samples or 17 per cent tested positive for PEDv. For the current month to date, 1,009 farms have been tested, of which 102 samples or 10.0 per cent tested positive for PEDv. Since testing was fully reported in November 2013, 17,881 farm samples have been tested, of which 3,344 samples or 18 per cent tested positive for PEDv. The total number of positive accessions on this report (up to the week of 12 October) is 8,702, 73 more than the previous week. Those states with 200 or more positive tests are: Iowa, 2,357; Minnesota, 1,437; Illinois, 984; North Carolina, 842; Oklahoma, 453; Indiana, 442; Ohio, 371; Missouri, 336; Kansas, 278, Michigan, 235 and Nebraska, 207. For the most recent week (week of 12 October), the state reporting the most new positive tests was Iowa with 19, followed by Minnesota with 11 and eight each in Illinois and Missouri. Also reporting one or more positive results were Arizona, California, Indiana, Kentucky, Michigan, North Carolina, Nebraska, Ohio, Oklahoma, South Dakota, Texas, Utah, Wisconsin and Wyoming. 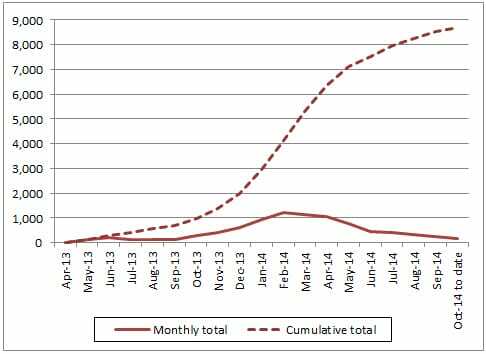 The total number of swine samples (termed 'biological samples' in the official report) since testing began in June 2013 now stands at 33,338. For the current month to date, 12,122 samples have been tested, of which 718 samples or 5.9 per cent tested positive for PEDv. Since testing was fully reported in November 2013, 208,086 samples have been tested, of which 15 per cent tested positive for PEDv. 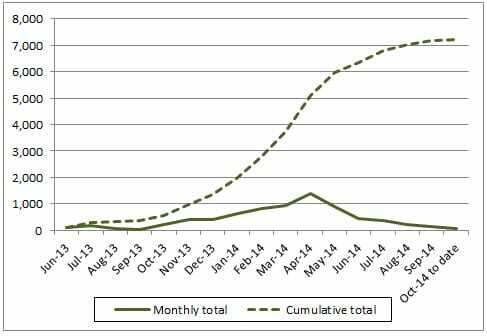 The total number of environmental samples testing positive since testing began in June 2013 now stands at 7,220. For the current month to date, 1,051 samples have been tested, of which 53 samples or 5.0 per cent tested positive for PEDv. Since testing was fully reported in November 2013, 35,794 samples have been tested, of which 19 per cent tested positive.